· Pilot-scale integrated systems consisting of biogas reactors, sequencing batch reactors, constructed wetland systems, sludge management, and nutrient/water reuse in a tannery industry and a slaughterhouse in eastern Africa, and harmonized protocols for optimization.· Operation of full-scale integrated systems with an up-flow anaerobic sludge blanket reactor, constructed wetland, sludge management, and an irrigation system at the Banana Investment Limited in Tanzania. · A cost-benefit analysis of the three different integrated wastewater treatment and resource reuse systems, including possible economic and operational ”bottle-necks”, and actual energy, nutrient and water reuse value by 2014. · Close cooperation with regional and local consultancy companies and construction companies, resulting in dissemination of the technologies. · Demonstration of productive cooperation between the private sector and universities in the region. Adolf Olomi, CEO Banana Investement Limited gives a tour of his wastewater disposal sytem. Project 5 will construct a pilot system that can recycle the wastewater and simultaneously produce biogas (photo credit: Bio-Innovate-ILRI/Albert Mwangi). 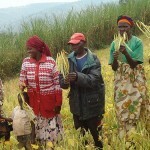 The project partners met for a monitoring and review meeting in Arusha, Tanzania from 5-6 September 2012. Present during the meeting were Makerere University (MAK-Uganda), Addis Ababa University (AAU-Ethiopia), University of Dar es Salaam (UDSM-Tanzania), Banana Investment Ltd. (Tanzania), AGENDA/ENVICON (Tanzania), the Bio-Innovate Program Management Team (PMT) and a technical advisory committee (TAC) representative. 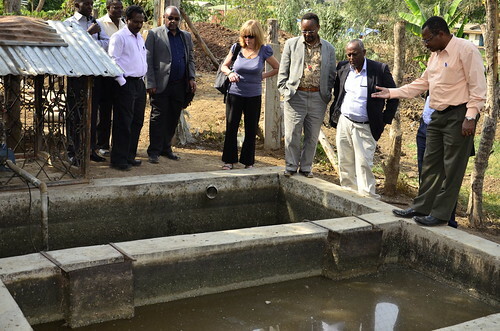 During the meeting, the consortium gave detailed technical presentations on the progress of their implementation activities.In ‘developing and optimizing biogas production and water/nutrient reuse for enhanced industrial and agricultural productivity in eastern Africa’, the consortium has so far finalized the design works for the biogas systems in the three countries; identified contractors in Ethiopia; and constructed wetlands and upgraded existing ones, installed biogas digesters, gas holding tanks and distribution systems in Tanzania and Uganda. On ‘evaluation and dissemination of the social and environmental benefits of the integrated wastewater treatment bioprocesses’ activities, the consortium has conducted baseline studies on environment and social benefits in the project areas. They have identified and analyzed stakeholders for the integrated process, and are currently producing a pre-project documentary that will help inform audiences interested in this kind of project. On ‘strengthening capacity to sustainably manage agro-process wastewater in eastern Africa’ the team is training students, research assistants and operators. They will also establish monitoring indicators and protocol as well as establishing laboratory facilities to undertake test on the biogas produced. The team will later on publish a number of scientific papers in reputable international journals. Karin Tonderski the TAC representative while giving her assessment of the consortium’s progress noted that although the progress of the implementation activities was good, some targets for 2012 were yet to be fulfilled. The delay in construction of key installations is affecting the timely delivery of project outputs, as many of the research activities are dependent on these facilities. “Focus on activities that can be delivered by 2013,” Karin recommended. Karin further advised that the team analyze the cost efficiency of the integrated systems they were constructing and identify challenges early enough. 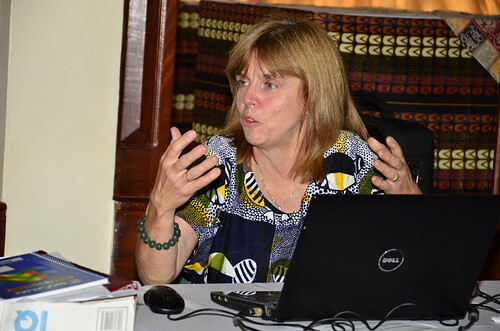 Karin Tonderski presenting her recommendations to the team (photo credit: Bio-Innovate-ILRI/Albert Mwangi). Seyoum Leta, the Program Manager, noted that overall the consortium’s progress was encouraging with all systems in place. 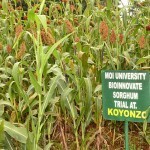 “If the technologies from this consortium prove to be technically and economically viable, Project 5 will be Bio-Innovate’s model project that demonstrates how to form partnerships between the public, private and NGO sectors as well as end users to develop innovations that solve social and environmental problems in the region,” Seyoum stated. 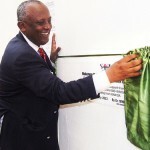 He urged the consortium to plan and make adjustments to cover for the lost time in 2011 occasioned by procurement delays. In addition, Seyoum advised the team to create a risk mitigation plan. The Program manager also advised the team in reporting results, to avoid generic and qualitative submissions. “The technical report from the consortium should be well analyzed and synthesized with clear pictures of the overall progress made,” he specified. On adherence to financial procedures, the project leaders were advised to comply with the standard operating manual (SOP) and always work with their financial officers while compiling and submitting financial reports to the program management office.